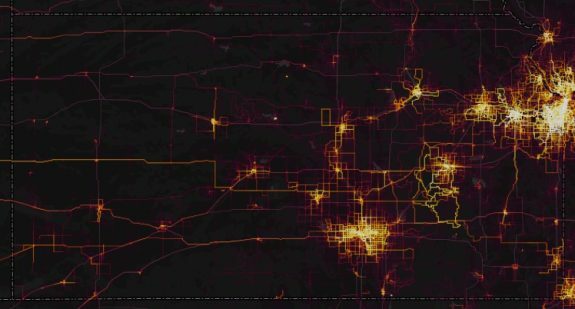 The fitness tracker web site Strava has released an 2017 update to their global heatmap. It shows user bicycling activity (and, optionally, other fitness activities) that have been recorded with GPS trackers. Given that only a subset of bicyclists use Strava, the results are not comprehensive, but they are nevertheless quite interesting. The color of the lines on the map represent relatively how many activities were recorded on those routes: from black (none) to red (a few) to white (many). In general, the results are what you might expect. The biggest hot spots are centered around the areas with the largest populations: Wichita, Johnson County, Lawrence, Topeka. Shining nearly as bright is Emporia, with an intensity out of proportion to its population. This is, no doubt, due to the Dirty Kanza, whose route can clearly be seen on the map. Among rail-trails, the Prairie Spirit Trail is visible, especially the northern end, as well as the long-established portion of the Flint Hills Nature Trail between Ottawa and Osawatomie. Mountain bike trails, due to their relatively small size, cannot really be discerned from the statewide view. But zooming in, the most popular trails can clearly be seen: Switchgrass, Perry, the Lawrence River Trails, WyCo, Shawnee Mission, Gunn Park, Lehigh, Santa Fe Lake, AirCap. Map geeks and data geeks rejoice! You can spend endless hours examining the map in exquisite detail, or at least I can. What fun! By the way, if you want to ensure that your rides show up on the map, be sure to get yourself set up with a Strava account at strava.com and record your rides using a GPS cyclocomputer, fitness watch, or smartphone app. Even if you use another fitness tracker, you can easily (and automatically) get your rides into Strava by using a third-party service such as FitnessSyncer or Tapiriik. 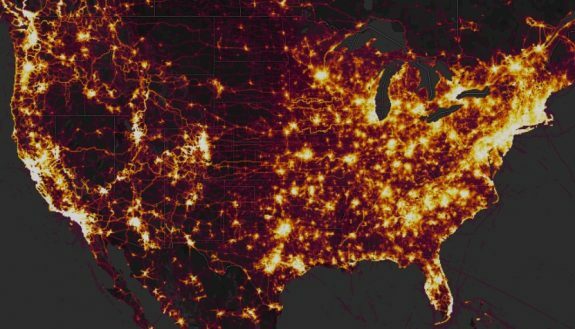 Logging your rides in Strava will also make it easy to participate in the annual National Bike Challenge. That is awesome!! Would look great as a framed pic on the wall in the office. Badger Creek (Fall River) and Horizon were popular MTB areas also.